A hitman is hired to carry out the honor killing of a young Muslim woman. 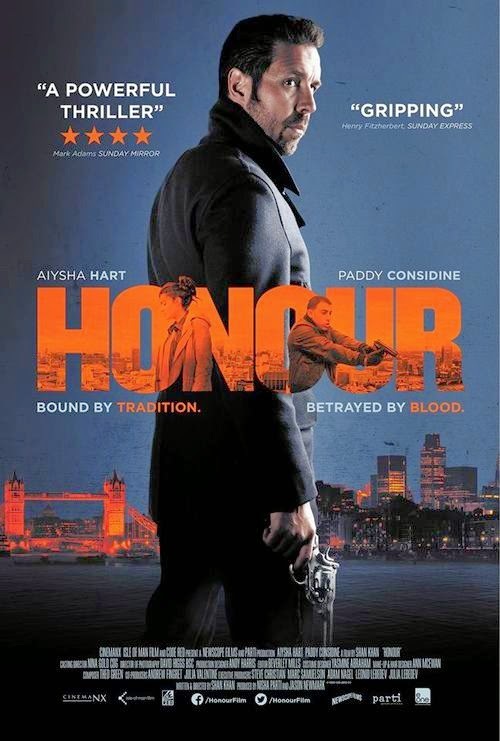 Honour is the first feature film effort for writer/director Shan Khan, and while it feels like a poor man’s Taken in almost every way, it still somehow feels genuine and worth your time. The film follows a family who have hired a hitman to kill a young woman in order to protect the honor of their family. While it is about the unsavory taboo, it never dives all the way into that world to the point that I was hoping. Perhaps it’s because it seems like the only times I ever come across stories of honor killings are in the in the random hour long episodes of your run of the mill detective shows, but I really believe that it is an issue that really needs more attention. This film is a good foot in the door. Having gone into this one expecting more of a Taken-esque film I would say I walked away with more of an indifferent demeanor than I hoped. The actors, with the exception of Paddy Considine, are relative unknowns that don’t really stand out, and while none are ever bad enough to bring attention in a negative way, none are irreplaceable either. The story, while it should have dug deeper into the world, gets the issue out there to the audience but feels more white noise than anything, because it doesn’t cross any lines or have any characters that we haven’t seen on television. Which is sad, because features should be able to go deeper into these topics than television shows. It always bugs me to feel indifferent about a film, especially one that is about something that is important, but while this one isn’t bad by any sense of the word, it doesn’t excel at anything either. Shan Khan boldly starts his career in feature films by attempting to tackle the hugely taboo topic of family honor killings. And especially for those who end up seeing this that are unaware that some cultures still practice this hellish way of life, this film will more than likely be eye-opening to them. Ultimately, the only reason that this barbaric act is still around is because a majority of the public generally don’t know that it is still a problem. Honor killing is disgusting, horrifying and downright wrong, but sadly, the film never earns our disgust or terror because nothing memorable happens. There is a definite attempt here to shine some light on a very dark topic, but without grabbing the audience and shoving them in a place that shocks and disturbs them, I don’t foresee the film getting much of a following.